1) Write the program. Cant program you say? No problem, I've written it already for you! But don't worry you wont get off the hook that easy. I've written the program so that a beginner can edit and change it to how you like. In the future, hopefully others will write source code and share for you to use. 2) Compile the program. Again, this is as easy as pushing the button labeled 'build'. Seriously. Compiling converts your program into a file that your microcontroller can understand. 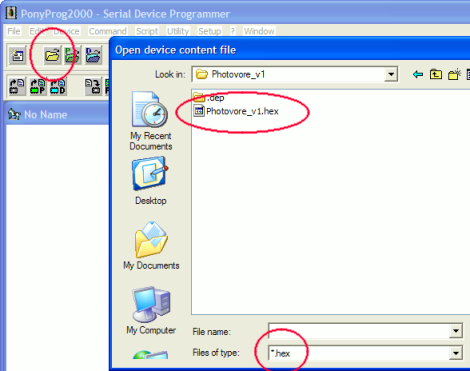 3) Upload the program to your microcontroller. Again, just plug in the programmer, and push the button that says 'program'. Easy, no? But before we can start programming your robot, you need some software. Ideally, I would like to give you just one single program to download and everything will work right away. This is the idea of WinAVR (22.8mb), as when you download it (yes, please download and install it), you get everything you need in one go. It will install a bunch of useful programs all in one location, including GNU Compiler Collection (GCC), GNU Binutils, avr-libc, avrdude, avrice, and a few others. Its all seamlessly built in, so I wont even bother you about them. For more information, check out the WinAVR user manual. 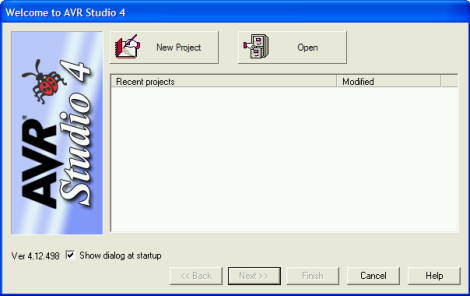 Don't install Programmers Notepad, its useless if you use AVR Studio, and has been know to be buggy in previous versions. The next program I will have you download is an IDE (Integrated Development Environment). 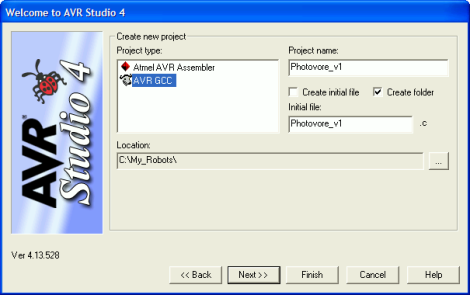 Atmel (the producer of the microcontroller you are using) offers this software, AVR Studio, for free. 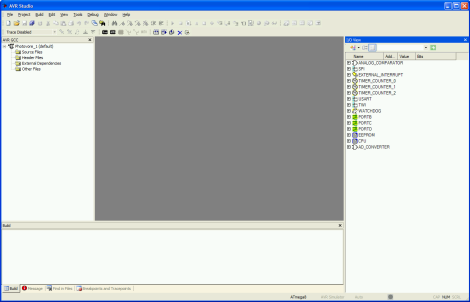 This IDE has a built in editor, compiler, uploader, etc all in one package. Atmel normally requires you to enter annoying registration info like your email address and phone number, but lucky you I bypassed it to offer you the direct link (suckers!). If that link breaks, or if you don't mind telling Atmel your home address for no reason at all, go here to download the latest AVR Studio software. And the untested v4.14 build 589 here (89mb). Copy the options that I have chosen. Make sure there are NO spaces in the file name. Also, the project file name must be the same name as the initial file. 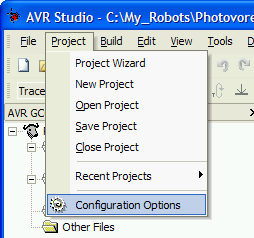 There is a 'feature' (bug) in AVR Studio that will cause you problems otherwise. Optional: You can also download AVRlib (1.5mb), which is a huge library of free AVR source code to make your life easier. For more information, view the online documentation for AVRlib. 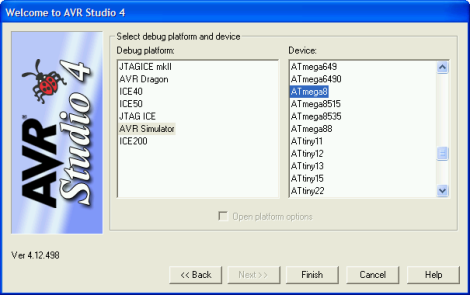 Now we need to add in the source code that you downloaded for AVR Studio. 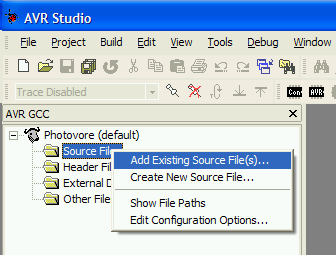 Right click 'Source Files' and left click 'Add Existing Source File(s)...'. 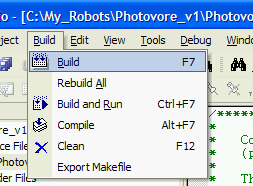 Locate Photovore_v1.c in your Photovore folder, and add it. You could also just drag and drop. The source code file is the one you would want to edit if you wanted to reprogram what actions your robot takes. Just like with the source files, now right click 'Header Files' and left click 'Add Existing Header File(s)...'. Locate SoR_Utils.h in your Photovore folder, and add it. This header file is filled with a lot of useful functions I wrote up for you. Now we must set up the options to compile your source code. 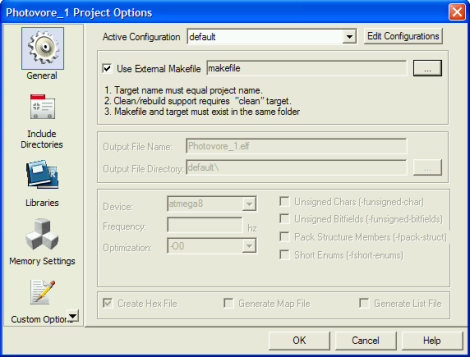 Go to Project -> Configuration Options. Check the box that says 'Use External Makefile' and then browse to locate the makefile (the file in the downloaded source code labeled 'makefile'). Then push OK. The final programming step is to compile the code. This converts your code written in C to machine code in a .hex that only your specific microcontroller can read. You should do a Rebuild All the first time you compile the downloaded source code. But after that, if you only make changes to the .c source file, you only need to do the faster Build command. If you get errors, and you are new to programming, it may be a little difficult to debug at first. Now we need to upload the .hex file you just compiled to the microcontroller via the AVR STK Serial Port Dongle Programmer. To do this, you need to download the newest version of PonyProg2000: v2.06f BETA. For more info on the program, check the PonyProg Documentation. After loading up PonyProg2000 again, you want to select 'Open Device File.' This is the beige folder looking button at the top left. Then go to your folder that has all your source code, and select/open the .hex file. 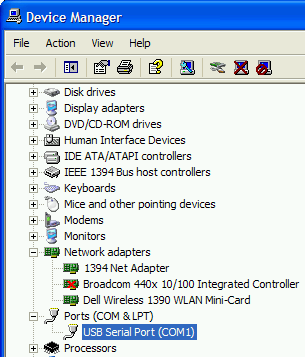 You might also need to configure which COM port you have the programmer plugged in to (serial port), as well as select ATmega8 as the microcontroller. My laptop has like 8 different USB ports so I had to try a few before it worked (I'm using a USB to serial adaptor). 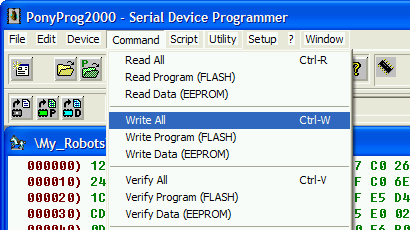 Plug in your AVR STK Serial Port Dongle Programmer to both your computer and your robot if it isn't already from Step 3C. AFTER plugging your robot in, turn on the microcontroller by flipping the ON/OFF switch, or plugging in the battery if it doesn't have one. If you were to unplug the programmer, make sure you turn off your robot first. Now select 'Write All' from the drop down menu. A Yes/No window will come up, select Yes. Wait while the program uploads. Try plugging in your programmer to a different port of your computer and then push Retry. Try each COM port until it works. After programming, hopefully, your robot now suddenly tries to commit suicide by driving off your table. Your are done! Congratulations! If you decide to use this programmer, please check out this post concerning pinouts of the programmer. update 2009: You can also try the cheaper but less functional Pocket Programmer at sparkfun (see parts list on first page). It uses a 10 pin connection, but most microcontrollers today only come with 6 pin connections (including the Axon). Just keep that in mind. update 2010: Users have reported using the more affordable 6-pin ISP programmer by Pololu successfully. It works fine in AVR Studio, and includes a basic oscope, too. I repeatedly see this question asked in the forum. 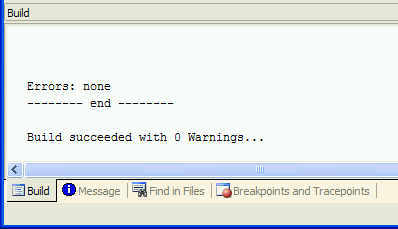 If you see the below error when you compile, it is because you didn't follow the directions carefully enough. Make sure you name your files and folders properly. 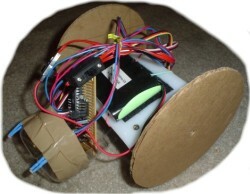 To begin your quest for changing my source code, you may be interested in reading my robot programming tutorials. You may also be interested in reading this great post that explains really well on how I programmed the servos. I wish you luck! Many of my future robots will now use this microcontroller, so everyone can benefit from source code that I plan to post for future robots. If you would like to document and share your robot and source code, or see what others have done, feel free to check out the member written tutorials. Got questions or comments? Post them on the robot forum! Try a forum search on '$50' to read questions that have already been asked before posting your question. I also highly recommend reading this post, as he seems to have found several problems I havent had time to address yet . . .
Was that too easy? Want to upgrade your $50 robot?